Being able to watch the classic Friday The 13th films on the big screen is a great nostalgic trip to the heyday of the franchise, but being able to watch them on at a drive-in is a huge added bonus. Thanks to the Skyline Drive-In located in Shelbyville, Indiana, fans will be able to do just that and watch Jason Lives: Friday The 13th Part VI. As an added bonus, Director Tom McLoughlin will also be in attendance to talk about the film and sign autographs! For more information, make sure to visit the theater's website at www.theskylinedrivein.com and get out there this weekend to talk to Tom and enjoy one of the most entertaining films in the franchise! 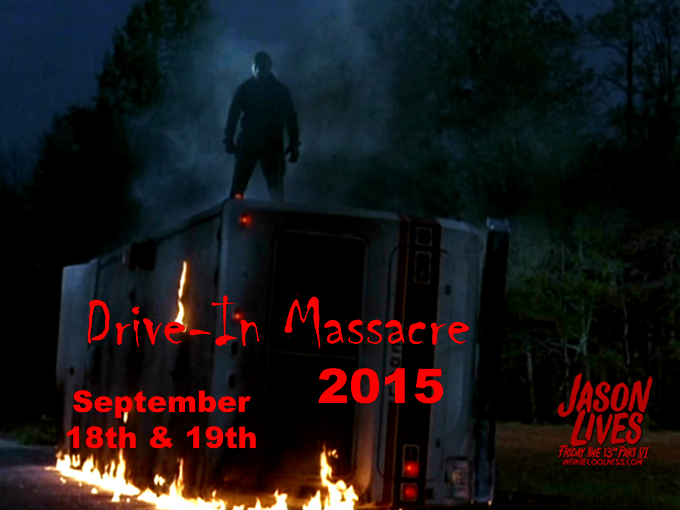 Movieside Presents: Drive-In Massacre 2015! Sept. 18th & 19th, 2015! The Skyline Drive-In 3986 E. Michigan Rd. Shelbyville, IN 46176 This is a charity benefit for Vital Bridges Announced Films: -Jason Lives: Friday The 13th Part VI with special guest Director Tom McLoughlin -HORROR HOTEL (Starring Christopher Lee!) -THE GATES OF HELL (Insane Lucio Fulci horror!) – Children Shouldn’t Play with Dead Things -Tickets are only $10 ($5 for children 11 and under)! -Free camping! -Vintage 35mm trailers! -Short films from local filmmakers! -Tons of other surprises! Both Friday & Saturday are identical and Tom McLoughlin will be appearing both nights. Horror Hotel at 8:30pm, Jason Lives: Friday The 13th Part VI at 10pm, The Gates of Hell at 11:45pm and Children Shouldn’t Play With Dead Things at 1:30am. Camping is included with admission and is available both nights. We open at 6pm each night. Admission is $10 for adults, $5 kids 3-11 and under 3 are free. We will be serving breakfast from 7am-9am Saturday and Sunday morning. We will have Vendors selling all kinds of memorabilia and also some cool giveaways. Autographs are free!